In its severe weather bulletin issued at 5am today, the state weather bureau said Samuel has maintained its strength as it continues to move toward the Dinagat-Samar-Leyte area. At 4am, the center of the tropical depression was spotted at 395 kilometers East of Surigao City, Surigao del Norte, packing maximum sustained winds of 55 kilometers per hour near the center and gustiness of up to 65 kph. It is moving Northwest at 20 kph. When the tropical cyclone is strong or is intensifying and is moving closer, this signal may be upgraded to the next higher level. The waves on coastal waters may gradually develop and become bigger and higher. The people are advised to listen to the latest severe weather bulletin issued by PAGASA every six hours. In the meantime, business may be carried out as usual except when flood occur. 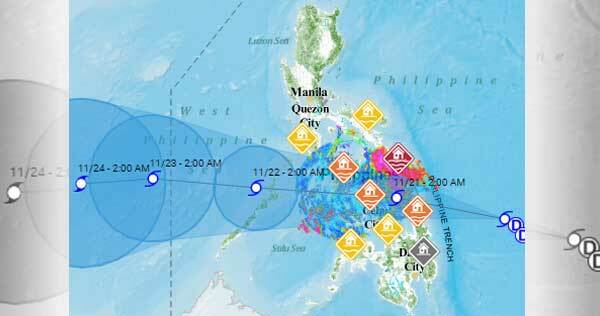 Disaster preparedness is activated to alert status. The weather agency advised the public in affected areas to inspect their house if necessary repair or fixing is needed, clean up their drainage system, harvest crops tha can be yielded, and monitor the latest Severe Weather Bulletin issued By PAGASA every six hours and hourly updates.